Jimmy Kimmel tells jokes for a living. He has a popular late-night television show called "Jimmy Kimmel Live." He is known for his jokes, silly interviews and a friendly rivalry with actor Matt Damon. Kimmel was also the host of this year's Academy Awards show, or Oscars. Kimmel usually begins his late-night show by joking about celebrities, current events and politics. But on Monday night, Kimmel started his show with a story about his newborn son, Billy. Kimmel had not been on TV since his son was born last month. He wanted to tell the audience why. Billy was born with a serious heart problem. The problem prevented his blood from receiving enough oxygen. The baby needed a medical operation to repair a part of his heart. He spent many days in the hospital. But eventually, he came home. Kimmel explained that his son will need another operation on his heart when he gets older. 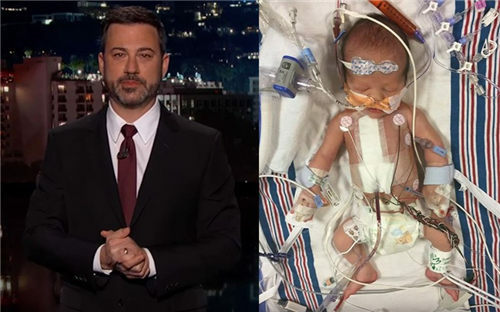 But for now, he is OK.
Kimmel almost started crying more than once as he talked about seeing his son in the hospital surrounded by medical equipment, doctors and nurses. "It's a terrifying thing," Kimmel said, his voice cracking. "I'm standing in the middle of a lot of very worried-looking people who are trying to figure out what the problem is." Kimmel also brought up the debate in the United States about health care. He said the fact that some politicians proposed major cuts to health care funding -- especially funding that goes to research hospitals -- "is so unbelievably sad." During his campaign last year, President Donald Trump promised to replace the Affordable Care Act. That is the health care law put in place by the administration of former President Barack Obama. Kimmel also said he saw a lot of worried parents at the children's hospital where his son was treated. "No parent should ever have to decide if they can afford to save their child's life. It just shouldn't happen." He asked the politicians who are meeting to discuss health care in Washington, D.C., to "stop with the nonsense" and "take care of each other." The crowd in the studio cheered. People around the world reacted to the emotional video. It became the top-ranked trending video on YouTube. More than 2 million people have watched it so far. Many people wrote comments on YouTube, thanking Kimmel for telling his story. Is it true that you’ve also been tapped to rethink the Academy Awards show? So far no one has admitted planting the bomb. Don't worry yourself about me, I can take care of myself. 1.That is the health care law put in place by the administration of former President Barack Obama. We put in place policies and tools to collect them. 2.I'm standing in the middle of a lot of very worried-looking people who are trying to figure out what the problem is. They're trying to figure out the politics of this whole situation.